Milan's eastern Zone 3 is a mostly residential area. There are recreational facilities on Milan's "sea" - the narrow, rifle-shaped Lake Idroscalo - and the campus of the Milan Polytechnic is in the middle of the district along the Valle Lombardia/Romagna road. Segrate (Milan 2) Segrate is a self-contained comune that surrounds the lake and park area of Idroscalo. Nicknamed "the sea of Milan," Idroscalo offers excellent facilities for many water sports, such as boating, canoeing, and water skiing. It is also the site of Europark Idroscalo, an amusement park as well as a venue for summer concerts and festivals. Segrate is also the locale of the notable residential centre Milano due (aka Milan 2). Built by a developer affiliated under Silvio Berlusconi's Gruppo Fininvest, Milan 2 was designed as a child- and pedestrian-friendly neighbourhood. It is served by several big supermarkets and a commercial area that thrives beside the San Raffaele Hospital near the neighbourhood's north entrance. Segrate Mosque, one of the few mosques in Milan, is in the neighbourhood's vicinity. The Linate Airport is close to Segrate, making it a convenient place to stay for those who constantly fly in and out of Milan. Of course, it also means that airplane routes go over some parts of Segrate. Still, has a lot to offer expatriates. 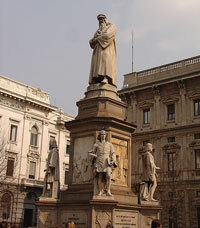 It is the location of one of Milan's top international schools, Sir James Henderson on Via Carlo Alberto Pisani Dossi. Citta Studi is a university quarter that grew around the Piazza Leonardo da Vinci, where the Polytechnic of Milan campus lies. This neighbourhood includes a number of exquisite old buildings preferred by distinguished Milanese families. It also has a lot of apartments that rent to students. 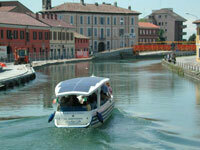 Navigli is known as the most romantic and quintessentially Italian area of Milan. But much like Brera, the Navigli quarter has lost some of its traditional allure as it has become more chic and commercialised. The craftsmen - bookbinders, violin makers, and artisans - that used to populate the area have mostly given way to the trendy bars and restaurants that line the canal banks. Some art galleries and studios can still be found, preserving Navigli's waning reputation as an artsy district. Traditionally Milanese case a ringhiera, apartment buildings centreed around small courtyards, are the common residences found here. Navigli derives much of its charm from the old canals that give the district its name (as "navigli" is Italian for "canals"). Naviglio Grande is the older and larger waterway, leading southwest from the Darsena (the Porta Ticinese dock) and stretching 50 km before connecting to the Ticino River. Naviglio Pavese is smaller, but it has the distinction of being an engineering project by Leonardo da Vinci. Today, cargo is no longer plied on the canals, but old barges moored in the Naviglio Grande are accoutered as open-air cafes and bars. Every month, an antiques market takes place along the banks of the Naviglio Grande; these are festive occasions, as the adjoining bars and restaurants stay open the whole time. Those looking for trendier finds can shop at the nearby Corso di Porta Ticinese, known for its youth-friendly fashion stores. Navigli remains one of the lovelier parts of Milan even as it has grown more commercial and touristy. Perhaps even more picturesque is the area of Martesana that lies on the Navigli's outskirts. Surrounding the Naviglio della Martesana, this neighbourhood was once the summer retreat for noble Milanese families.